We have been warned of the perils of excessive sitting: „Sitting kills“, „Too much sitting“, „More breaks from sitting“, „The new smoking“, „Your chair is trying to kill you“, „Sitting time and mortality“, „Sitting down could be killing you“,“Sitting bad for us“, „Anti-sitting movement gaining followers“, „Sitting yourself to death?“, „Your chair is your enemy“,“much fuss about sitting“, etc. But what is the killing agent within, the real culprit, the primary factor ? This type of question has not yet been answered satisfactorily. I would like to draw your attention to the factor of intra-abdominal hypertension caused by „correct“ sitting. - and the time factor. In spite of being almost completely ignored and neglected by researchers of sedentary behavior the intra-abdominal hypertension (IAH) that is being created during correct sitting seems to be the most destructive factor, because it may restrict capillary circulation and diminish oxygen and nutrient supply of abdominal organs creating precarious conditions for cell functioning. When this silent ischemia or persistent oxygen deficiency goes on for years and decades all affected organs will manifest pathological reactions. If a deficit or lack of oxygen could be proven to be the root cause of most „sitting diseases“ the name oxygen deficienc disorders (ODC) or oxygen deficiency syndromes (ODS) would be appropriate. These diseases may not be generated by a concrete cause, but by the lack of the tangible agent oxygen like avitaminosis or hypovitaminosis is caused by the lack of certain vitamins. The scarcity of oxygen has a ‚toxic‘ effect on cellular respiration. This allegation may be considered as an extension of the Warburg hypothesis that focussed solely on the origin of cancer. The „Abdominal Compartment Syndrome“ (ACS) represents the pathophysiologic consequences of raised intraabdominal pressure. It is caused by an elevated pressure within the abdomen. Hence prolonged sitting may be provoking a moderate version of the Abdominal Compartment Syndrome (ACS). ACS is usually being measured in a flat (supine) position. Until now, the abdominal effects of correct sitting and the abdominal compartment syndrome (ACS) have not been correlated as to my knowledge. When I had my intra-abdominal pressure measured (rectally) in an upright sitting position the result was 25 mmHg, and in a more forward bent posture it was 35 mmHg ! This is much more than ergonomic sciences, public health authorities or the World Society of he Abdominal Compartment Syndrome (WSACS) should be tolerating, I believe. Unfortunately, I cannot find any other measurement data on abdomenopelvic pressure of „correctly“ or leisurely sitting persons in the medical literature. I would like to invite you to falsify my measurement data in order to be able to verify or falsify my hypothesis that „correct“ sitting is causing intra-abdominal hypertension (IAH). After years and decades the undersupply of oxygen and nutrients in abdominal tissues caused by IAH seems to seriously compromise organ function and even cause cancer as you well know. Normal cell response to underoxygenation is ischemic cell stress leading to organ-degrading biochemical chain reactions. If we want to convince public health services, WHO and OSHA of the necessity of a sitting reform we would need a large number of intra-abdominal pressure (IAP) measurement data. Obesity is another factor that enhances IAP by demanding space within the limitations of the abdominal compartment similar to a tumor or edema. Excessive body fat plus sitting pressure is a destructive combination. Elevated compartmental pressure is a provoking agent and accelerator of chronic diseases by causing decreased perfusion, hypoxia and the onset of anaerobic metabolism in the affected tissues. Pre-eclampsia in pregnant women is a vivid model case for intra-abdominal hypertension (IAH) diseases. The intrinsic pressure in the womb is being aggravated by the additional extrinsic pressure of sitting around too much by pregnant women. In this case of elevated gestational pressure pregnancy seems to represent a time-lapse model of chronic diseases that may take years and decades to develop under ‚normal‘ sedentary conditions. Usually the symptoms and syndromes of pre-eclampsia disappear right after the decompressive act of birth. This process is excellent proof of the destructive effect of intra-abdominal hypertension. If pregnancy went on for a few more months all becoming mothers would presumably die from multiple organ failure. Another such case is Chronic Kidney Disease (CKD). Nobody seems to suspect a correlation or causal relation between the gradual loss of kidney function over a period of years and the dominant lifestyle of excessive sitting in industrial societies. It seems obvious to me that there is a close causal connection between chronic sitting pressure and chronic renal failure. In spite of a ‚multifactorial etiology‘, low back pain, high blood pressure, COPD, pelvic floor dysfunction, vulvodynia, constipation, endometriosis, prostatitis, prostate cancer, renal failure, adnexitis, polycystic ovary syndrome, Morbus Crohn, ulcerative colitis, hemorrhoids, Alzheimer’s, pudendal nerve entrapment, breast cancer, irritable bowel syndrome, colon cancer, pelvic pain, incontinence and impotence, to name just a few chronic diseases, seem to be primarily caused by long lasting (intermittent and fluctuating) pressures on certain organs caused by excessive sitting. The most common form of Alzheimer‘s is linked to the apolipoprotein E (apoE) gene on chromosome 19. Scientists don’t know how apoE4 increases the risk of developing Alzheimer’s. – Could it be a long-lasting underoxygenation caused by prolonged sitting? The older you get the more you sit. The genes are there, but they seem to do no harm unless they are being persistently provoked. Underoxygenation is an enormous provocation for cells and tissues. When we talk about ‚multifactorial disorders‘ in context with Alzheimer’s we almost never consider the elevated abdominal pressure during sitting and its impact on the brain. Please watch the famous pianist Glenn Gould on youtube playing the Goldberg variations. While playing the piano he always sat on a very low chair (31 cm), a gift from his father. He died at age 51 from heart problems. I am convinced that he compressed himself to death by his peculiar highly compressive sitting style. Presumably, the global sitting epidemic is a much heavier burden on public health than tobacco smoking because it affets almost the entire populations of developed and developing countries. If we can obtain enough reliable data on intra-abdominal hypertension during sitting we can start a sitting reform by convincing the WHO, OSHA and other public health authorities of its necessity. Remember the long lasting fight against the tobacco industry. Die staatlichen Schulen zählen zu den Krankmachern Nr.1 in Österreich. Der folgende Leserbrief für eine Regionalzeitung bezieht sich darauf. Auf der Webseite www.alpenoffice.at finden Sie weitere Ausführungen zum Thema. Ich möchte Sie hiemit auf diesen Problemkreis aufmerksam machen. Das mit der „Abschaffung des Sitzenbleibens“ war eine Art Falschmeldung. Die Wiederholung einer Klasse wird vielleicht abgeschafft, nicht aber das Sitzenbleiben in der Schule! Daran hat sich nämlich nichts geändert: Mit der Einschulung übernimmt der Staat ohne jede Legitimation die Verwaltung unseres Körpers und zwingt uns in eine dreifach abgeknickte Arbeitshaltung während der Unterrichtszeiten, -das heißt, mindestens neun Jahre wie beinamputiert in einer Klasse herumsitzen! Die Selbstregulierung der Beweglichkeit des eigenen Körpers wird damit staatlich blockiert. Was die Schule wirklich erfolgreich betreibt, ist unsere Vorprogrammierung auf die Sitzmisere im späteren Leben. Der staatliche Sitzzwang, exekutiert von unseren Schulen, ist der erfolgreichste Mechanismus für Krankheitserzeugung in unserer Gesellschaft. Bewegungsarmut ist heute das Hauptproblem in allen Industrieländern. Tausende Jahre bewegten wir uns zehn bis zwölf Stunden am Tag bei der Arbeit und beim Ortswechsel, heute sind es 20 bis 25 Minuten infolge der Maschinisierung und Automobilisierung seit den 1950er Jahren und infolge überlanger Sitzzeiten. Wir alle leiden unter akutem Bewegungsmangel. Rückenschmerzen, Bandscheibenvorfall, Fettleibigkeit, Diabetes 2, Bluthochdruck, erhöhtes Sterblichkeitsrisiko, Schlaganfälle, Thrombosen, Arthrosen, Prostatabeschwerden, verminderte männliche Fruchtbarkeit, erektile Dysfunktion, Verdauungsstörungen, Hodenkrebs, Darmkrebs, Beckenbodenschwäche mit Inkontinenz, Krampfadern, Resignation, Apathie, erlernte Hilflosigkeit und Depressivität hängen aufs engste mit überlangen Sitzzeiten zusammen, betont die neuere Sitzforschung. Man kann diese Symptome und Syndrome auch ‚politogen’ oder ‚statogen’ nennen, also „vom Staat erzeugt“! Die staatliche Schule ist das Trainingslager für ein Fehlverhalten, das wir lebenslänglich beibehalten, weil wir so intensiv darauf geprägt wurden. Noch bevor ein Schüler die Schule betritt, ist seine jahrelange Abknickung und Arretierung auf engstem Raum bereits beschlossene Sache. Mit dem Sitzzwang, der erzwungenen Sedierung, dringt der Staat in unseren intimsten Bereich ein, ins Becken, und ins „Heiligtum“ des menschlichen Leibes, die regio sacralis, das Kreuz. Verhaltensauffälligkeit und Zappeligkeit von Schülern sind eine ganz natürliche Reaktion auf die exzessive Arretierung im Schulgestühl. In Deutschland gibt es angeblich 400.000 Schüler mit dem Hyperaktivitätssyndrom, 40.000 von ihnen erhalten Ritalin als medikamentöse Sedierung. Im Büro geht es später mit dem Dauersitzen lustig so weiter. Die Folgen sind physiologisch und psychisch eine nationale Katastrophe, die Therapierungen werden die Krankenkassen in wenigen Jahrzehnten nicht mehr bezahlen können. Es handelt sich beim Dauersitzzwang um eine gespenstische Fehlentwicklung der staatlichen Ergonomie, die erzwungene Sedierung drängt unsere Kinder in die Teilnahme an einem gesundheitlichen Verliererprojekt. Die Arbeitsmedizin schaut dabei zu und runzelt die Stirn, tut aber nichts Gescheites. Dauersitzen bei der Arbeit ist kein Schicksal. Wie’s besser geht, sehen Sie in den Infozentren der österreichischen Finanzämter. Dort wird die „Wechselhaltung in Stehhöhe“ seit d.J. 2007 praktiziert. Schauen Sie sich das an! Gearbeitet wird in Stehhöhe und die Beamten können dabei sitzen, stehen, halbsitzen und stehsitzen, selbstbestimmt und in fließenden Übergängen ihre Haltung ständig wechseln. Das ist die modernste Arbeitshaltung der Welt. Jeder (Osttiroler) Tischler kann Sie, Ihre Kinder und Ihre Mitarbeiter vor dem ergonomischen Schwachsinn des Dauersitzens bewahren. Anlässlich der Renovierung des Parlaments möchte ich Ihnen vorschlagen, die Arbeitsplätze im Plenarsaal des österreichischen Parlaments zu reformieren. Das Parlament gibt in puncto Arbeitshaltung der Nation seit vielen Jahren das denkbar schlechteste Vorbild. Dauersitzen ist eine schwere Gefahr für die Gesundheit. Werfen Sie bitte einen Blick auf die Webseite www.alpenoffice.at, dort finden Sie die wissenschaftlichen Hinweise. Manche Ihrer Sitzungen im Parlament und in den Ausschüssen dauern dem Vernehmen nach bis zu 14 (vierzehn) Stunden. Das ist 'unmenschlich' und schwer gesundheitsgefährdend. Es ist daher zu vermuten, dass längerdienende Parlamentsmitglieder mindestens unter drei bis vier der folgenden Symptome und Syndrome leiden oder bald darunter zu leiden haben werden: Rückenschmerzen, Bandscheibenvorfall, Fettleibigkeit, Diabetes 2, Bluthochdruck, Herz-Kreislaufprobleme, Schlaganfall, erhöhtes Sterblichkeitsrisiko, Verdauungsstörungen, Prostatabeschwerden, Darmkrebs, Hodenkrebs, verminderte männliche Fruchtbarkeit, Thrombosen, Krampfadern, Hüft-und Kniearthrosen, Beckenbodenschwäche mit Inkontinenz und Depressionen - sie hängen erwiesenermaßen aufs engste mit überlangen Sitzzeiten zusammen. Dauersitzen leiden! Sie selbst werden das aus der Vorsitz-Perspektive sicherlich oft beobachtet haben. Ihre Körpersprache spricht Bände. Sie haben sicherlich auch bemerkt, unter welchen Vorwänden und wie oft die Abgeordneten die Sitzflucht antreten, getrieben von unbewussten Signalen, die ihnen ihr Körper sendet. rasante Motorisierung und Automatisierung seit den Fünfzigerjahren und durch überlange Sitzzeiten, die uns allen durch eine gedankenlose Möblierung auferlegt werden. Mit dem Schuleintritt werden wir alle in die dreifach abgeknickte Sitzhaltung gezwungen und jahrelang darauf gedrillt, dass diese Falschheitsübung die richtige Arbeitshaltung ist. Der Staat hat zwar das Recht, uns zum Schulbesuch zu zwingen, aber woher nimmt er das Recht, uns auf eine krankmachende Haltung zu prägen! Das Sitzen in den Verkehrsmitteln, vor dem Fernseher und dem PC tun ein Übriges. Die alte Ergonomie für Büro-, Schulungs-und Beratungsarbeitsplätze ist obsolet und ein schwerer Schaden für die Volksgesundheit. Mit einer Reform dieses unsinnigen Brauchs könnten Sie an eine ruhmvolle Hygiene-Reformtradition der österreichischen Sozialdemokratie anschließen, dafür braucht es nur Mut. Dem Homo erectus entspricht die aufrechte Haltung und die Stehhöhe bei der Arbeit. Deswegen ist die Sichel zur Sense weiterentwickelt worden. Die konventionellen Möbel im Parlament -wie in allen österreichischen Büros - zwingen zum Dauersitzen, sie bewirken nach Jahren des Sitzens ein gesundheitliches Desaster und kosten die Krankenkassen Milliarden für Therapierungen. Die Kuhstall-Ergonomie ist in Österreich bereits weiter entwickelt als die Büro-Ergonomie: In fortschrittlichen Ställen gibt es keinen Melkschemel mehr, der die zusammengeknickte Melkhaltung erzwingt. Der Melker steht in einer Grube unter bzw. neben der Kuh und kann im Stehen aus der Ellbogenhöhe arbeiten. Falsche Fragen erzeugen falsche Antworten. Wer immer nur fragt: Wie sitze ich richtig? wird immer bei dem Irrtum landen, der für österreichische Arbeitsplätze charakteristisch ist. Die richtige Frage lautet jedoch: Welche Arbeitshaltung ist die beste ? Die richtige Antwort darauf lautet: Die nächste! Der möglichst häufige Wechsel der Haltungen also. Der ist nur in Stehhöhe möglich, am ellbogenhohen Tisch mit einem Hochstuhl bzw. einem Klappstuhl in Stehhöhe wie ein Barhocker. Jetzt kann der Wechsel zwischen Sitzen, Stehen, Stehsitzen und Halbsitzen mühelos praktiziert werden. Jetzt geht erwiesenermaßen alles schneller, auch die Beratungen, und die Menschen fühlen sich nicht mehr durch das viele Sitzen wie erschlagen. Die Wechselhaltung wird bereits seit 2007 an allen österreichischen Finanzämtern in den Infozentren praktiziert. 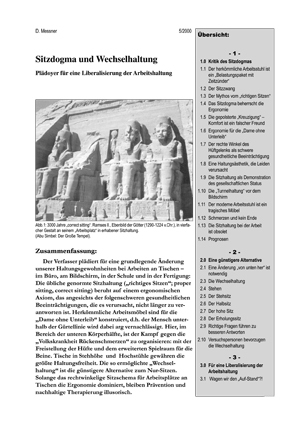 Dort können Sie diese auch studieren und die Beamten fragen, wie es ihnen am hohen Setting mit der Wechselhaltung geht. Aus meiner Sicht handelt es sich um die effizientesten und gesündesten Arbeitsplätze der Welt. Ich möchte Sie einladen, über die Vorteile dieses Haltungssystems für das Parlament nachzudenken und nachdenken zu lassen. Es wäre Aufgabe der Arbeitsmediziner, alles daran zu setzen, dass wir diesen unsinnigen Brauch durch etwas Besseres ersetzen. Er ist ihnen vielleicht deshalb so lieb, weil er eine sprudende Einnahmsquelle für ihre Zunft darstellt. Leider sind auch Ärzte - wie alle Zeitgenossen - kulturblind, d.h. sie werden in österreichischen Schulen und Hochschulen auf das Dauersitzen geprägt und meinen schließlich, das sei ganz normal menschlich und physiologisch akzeptabel. Sie sitzen im gleichen kognitiven Gefängnis wie die meisten von uns. Millionen arbeitende Menschen haben unter diesem obsoleten Brauch zu leiden, der relativ leicht zu ändern wäre. Dreieinhalb Milliarden Jahre Lebendigkeit werden im Sitzzwang umfunktioniert zu einer kreislaufstauenden Körperblockade im Stuhlgefängnis. Unsere Schulkinder sind allesamt "vertikal behindert" ("vertically challenged"). Das mag politisch korrekt sein, ist aber eine physiologische Katastrophe! Wir Österreicher hätten dann weltweit das erste Parlament, das seiner Nation ein nachhaltig gesundes Vorbild für eine gute und richtige Arbeitshaltung geben könnte. Und Sie und Ihre Kollegen würden nebenbei Ihr Politiker-Sitzleben durch eine Reform der Arbeitshaltung beträchtlich erleichtern und nicht nur der Nation, sondern der ganzen demokratischen Welt ein Beispiel für unbehinderte Lebendigkeit geben! Sie haben derzeit anlässlich der Sanierung des Gebäudes eine Jahrhundertchance – nach dem Motto: "Wenn du jetzt den Auf-Stand nicht wagst, werd' ich dir weiterhin fern bleiben! Deine Gesundheit." 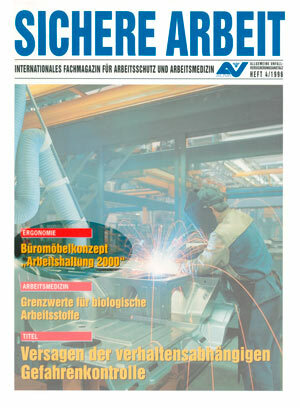 Ihre bewusstseinsbildende Arbeit zugunsten von mehr Bewegung in Schule und Büro begrüße ich seit langem und freue mich über die Artikel von Dr. Breithecker zum Thema! Ich möchte Sie einladen, etwas radikaler zu werden und die Korrektur des Sitzverhaltens auf dem Weg über die Gesetzgebung einzuleiten. Ich propagiere die WHS (Wechselhaltung in Stehhöhe) und habe Herrn Dr. Breithecker bereits über diesen Vorschlag informiert. gegenüber dem herkömmlichen Sitzen und dem herkömmlichen Stuhl intolerant (sic!) auftritt und dem Sitzen einen weniger ehrenvollen Platz unter mehreren möglichen Arbeitshaltungen zuweist. Ihr viel zu toleranter Umgang mit dem deutschen Schul- und Bürogestühl wird die Misere nicht beseitigen. Sie sprechen in überaus schonungsvoller Weise nur von "Kopf-und Rückenschmerzen". Das ist eine Vertuschung der wahren Situation. In Deutschland gibt es keine ernstzunehmende Sitzforschung. Aber die internationalen Studien zu dem Thema sprechen eine klare Sprache: Fettleibigkeit, Bluthochdruck, Herz-Kreislaufprobleme, erhöhtes Sterblichkeitsrisiko, Thrombosen, Krampfadern, Hodenkrebs, Prostatabeschwerden, verminderte männliche Fruchtbarkeit u.a. Symptome und Syndrome stehen in engstem Zusammenhang mit langen Sitzzeiten. Eine "Flugthrombose" ist natürlich keine Flugthrombose, sondern eine Sitzthrombose, und in den allermeisten Fällen eine Bürothrombose. Warum gibt es so viele Hüftgelenksoperationen? Auf deutschen Internetseiten werden dafür "Verschleißerscheinungen" verantwortlich gemacht. Kein Wort von Unterforderung oder Bewegungsmangel durch vieles Sitzen, das die Gelenke ruiniert. Intensive Menschenmast betreibt man am besten auf Schul- und Bürostühlen. Niedrigtische und Niedrigsitze erzwingen die permanente Sitzhaltung, die Abknickung des Körpers im Hüft-und Kniegelenk, die Behinderung der Durchblutung usw.,- darüber muss ich Sie nicht belehren. Wenn Sie aber den gesamten Arbeitsplatz auf Stehhöhe bringen, einen Hochstuhl (Barhocker-Vorbild) beschaffen und unter dem Tisch mindestens zwei Fußstützen anbringen, befreien Sie die Zwangssitzer aus ihrer erbärmlichen dreifach geknickten Haltung, die vermutlich auch Sie selbst an Ihren Schreibtischen einzunehmen gezwungen sind, weil man Ihnen nie eine andere Wahl gelassen hat. Wesentlich ist in der WHS- Konfiguration der Hochstuhl. Im Gegensatz zum Niedrigstuhl ist er ein Diener, kein Diktator der Arbeitshaltung. Das haben die EU-Normgeber noch nicht erkannt, die den Wechsel von Stehen und Sitzen im Büro empfehlen. Deutsche Bürostühle sind als krankheitserregende Substanzen zu klassifizieren, die arbeitende Bevölkerung ist diesen Geräten zur Zeit schutzlos ausgeliefert. Schüler in jungen Jahren in die Dreifachknickhaltung zu zwingen ist eine einzige ergonomische Zumutung, die ein Fall für den Staatsanwalt wäre, gäbe es nicht zu viele Tatorte. Gewohnheiten trüben den Verstand, daher sind wir oft unfähig, dumme Traditionen und Falschheitsübungen zu durchschauen und abzustellen. Der hohe Arbeitsplatz ist der ideale "Gefechtsstand" für den dauernden Kleinkrieg gegen die Schwerkraft, der unbedingt und mit möglichst vielen Muskeln und Gelenken zu führen ist. Der Niedrigsitz entmannt, schwächt und macht krank. Der Übergang von stehender Büroarbeit im Kontor des 19. Jh. zum Niedrigsitz, den die Frauen ab 1874 an der Schreibmaschine vorführten, war der größte ergonomische Sündenfall der deutschen Büroarbeitsgeschichte. In diesem "Konzentrationssitz" müssen heute Millionen Menschen ihr Arbeitsleben fristen. Auch die Amerikaner, die den Deutschen diesen Unsinn nachmachten, wissen keinen besseren Rat als ihre Büroarbeitskräfte mit solchen technisch hochraffinierten Sitzgefängnissen zu schinden. Das hat die ORGATEC unlängst wieder gezeigt - ein Hochamt für den alleinseligmachenden Gott Bürostuhl unter Verschweigung der Millionen Menschenopfer, die er fordert. Ich lade Sie ein, bei der Revolution gegen diesen schädlichen – inzwischen internationalen – Brauch mitzuwirken und die Diktatur des niedrigen Arbeitsplatzes womöglich auch auf politischer Ebene zu bekämpfen. "Sitzpolitik" muss ein Teil der Gesundheitspolitik werden. Sie nach Kräften zu unterstützen. Dieter Messner: Lieber Gernot Steifensand! Die Binsenweisheit „Sitzen macht krank“ wird zwar allgemein anerkannt, aber kaum beachtet. Woher nimmst du als Sitzmöbelfabrikant die Verwegenheit, das geheiligte Sitzen am Schreibtisch in Frage zu stellen ? Damit schießt du dir doch ins eigene Knie! Gernot Steifensand: Wenn du merkst, dass du ein totes Pferd reitest, dann steig ab! lautet eine Weisheit der Dakota-Indianer. - Ich stelle keineswegs das Sitzen in Frage, sondern nur das ausschließliche Sitzen, das Dauersitzen, das mittlerweile unseren Lebensstil beherrscht. Die neuesten Ergebnisse der medizinischen Sitzforschung haben auch mich derart alarmiert, dass ich eine Reform unserer Sitzgewohnheiten für unausweichlich halte. Wir Sitzmöbelhersteller haben hier eine große Verantwortung. Wir haben den Bürostuhl in gut hundert Jahren ‚zu Tode geritten’ und dabei unsere Gesundheit gefährdet. Wir müssen uns jetzt etwas ganz Neues einfallen lassen! Deshalb sehe ich deinen Vorschlag , vom Dauersitzen zur „Wechselhaltung in Stehhöhe“(WHS) überzugehen, als Chance für die ganze Branche. Das ist eine Haltungsrevolution, hinter der ich auch persönlich stehe (nicht sitze)! Dieter Messner: Das ist freut mich natürlich, aber du wirst deine Händler und Kunden vor den Kopf stoßen, wenn du Sitzrevolution machst und etwas völlig Unübliches propagierst! Steifensand: Das habe ich auch nicht vor. Wer weiterhin so sitzen bleiben möchte, wie er es gewöhnt ist, wird unsere Qualitätsstühle weiterhin zum besten Preis kaufen können. Wer aber mit der heutigen Situation unzufrieden ist und unter dem vielen Sitzen leidet, dem werden wir die gesündere neue Lösung anbieten: die Wechselhaltung in Stehhöhe (WHS), von der auch ich überzeugt bin, dass sie die beste und modernste Lösung des Sitzproblems darstellt! Aus diesem Grund widme ich diese Nummer der SITWELL NEWS zur Gänze dem neuen Konzept der Wechselhaltung. Messner: Ich betrachte das Sitzen als eine von vielen möglichen Arbeitshaltungen. Ganz neu ist das Konzept der Wechselhaltung ja nicht. Im Männerbüro des 19. Jahrhunderts, dem Kontor, wurde fast ausschließlich in Stehhöhe an Pulten gearbeitet, dazu gab es auch hohe Hocker zum Hochsitzen und sogar Fußschemel. Französisch ‚le bureau’ ist ursprünglich das Stehpult, als Verlängerung der Werkbank war es Teil der Männerwelt. Steifensand: Und die Damen marschierten erst im Gefolge der Schreibmaschine ins Büro ein. Messner: Du sagst es. Weibliche Schreibkräfte hatten sich bei Tests als fingerfertiger erwiesen als die Herren der Schöpfung. Mit den neuen Schreibgeräten eroberten Frauen Arbeitsplätze in der sozial gehobenen männlichen Bürowelt. Es wäre damals (um 1880) ein Verstoß gegen den Schicklichkeitscodex gewesen, die Damen im Büro stehend arbeiten zu lassen. Sie wurden also in wohlanständiger sitzender Haltung vor ihre Schreibgeräte an niedrigen Tische gesetzt. Die neuen Büroarbeitsplätze waren ein großer Schritt in Richtung Emanzipation der Frauen, allerdings mit üblen Folgen für die männlichen Büroarbeiter. Sie mussten nach dem Vorbild der Damen bald auch im dreifach geknickten Sitz an niedrigen Schreibtischen arbeiten! Steifensand: Die Arbeitshaltung im Büro wurde also weiblich ‚genderisiert’. Warum haben sich die Männer denn nicht dagegen gewehrt? War Sitzen komfortabler? Komfortabler ist Sitzen nur für kurze Zeit. Sitzen vermittelt die Illusion von Komfort, ist in Wahrheit aber Schwerarbeit im Sinne von Überforderung einzelner Gewebestrukturen und Unterforderung anderer. Steifensand: Welche Vorteile hat demgegenüber die „Wechselhaltung“ ? Messner: Die Wechselhaltung in Stehhöhe ist nicht auf das Sitzen fixiert, sondern betrachtet das Sitzen als eine von mehreren guten Haltungsmöglichkeiten bei der Arbeit. Sie propagiert den häufigen Wechsel der Haltungen. Nur wenn ich dazu Lust habe, kann ich sitzen, muss es aber nicht, ich kann auch stehen, stehsitzen oder halbsitzen und immer wieder wechseln. Steifensand: Ich behaupte einmal: So kann man nicht arbeiten! Messner: Dann darf ich dir empfehlen, die Arbeitsvorgänge in den Infozentren aller österreichischen Finanzämter zu beobachten: Dort wird seit 2007 höchst effizient in der Wechselhaltung gearbeitet. Steifensand: Warum tun wir das nicht längst schon alle? Messner: Weil wir die Bequemlichkeit lieben und von Kindesbeinen auf diese Haltung geprägt worden sind! Wir lassen uns von Gewohnheiten beherrschen, auch wenn sie falsch und gefährlich sind. Von der biologischen Funktion her gesehen ist der Sitzbrauch schädlicher als der Brauch der weiblichen Genitalverstümmelung. Es ist also höchste Zeit, dass sich die Männer von dieser „Frauenhaltung“ emanzipieren und dass sich auch die weiblichen Bürotätigen vom Sitzzwang emanzipieren! Steifensand: Warum sollte ein Büromensch ins Lager der „aufständischen“ Wechselhaltung überlaufen, wenn er auf einem schönen, bequemen und teuren Bürostuhl sitzt ? Messner: Weil er sich damit der Gefahr aussetzt, beim vielen Sitzen nachhaltig gesundheitsschädliche Symptome und Syndrome ‚auszubrüten’. Steifensand: Also Rückenschmerzen und Bandscheibenvorfall ? Messner: Das ist nicht alles. Vergiss bitte nicht Fettleibigkeit, Diabetes 2, Bluthochdruck, erhöhtes Sterblichkeitsrisiko, Schlaganfälle, Thrombosen, Arthrosen, Krampfadern, Hodenkrebs und verminderte männliche Fruchtbarkeit! Psychische Folgen wie Apathie und Depressionen werden ebenfalls in Zusammenhang mit langem Sitzen gesehen. Alle diese Symptome werden meist höflich verschwiegen, man hört immer nur von Rückenschmerzen! Steifensand: Ist das bewiesen ? Messner: Bitte informiere dich im Internet über die Ergebnisse der Sitzforschungen von Elin Ekblom-Bak, David Dunstan, Peter Katzmarzyk, Osmo Hänninen und anderen. Ihre Forschungsergebnisse belegen den engen Zusammenhang der genannten Symptome und Syndrome mit langen Sitzzeiten. Demnach sind die nachhaltigen gesundheitlichen Schäden aufgrund langer Sitzzeiten auch durch Ausgleichssport nicht mehr zu kompensieren! Du warst doch auf der ORGATEC in Köln. Aus meiner Sicht war das eine reaktionäre Veranstaltung, wo immer noch ein obsoletes Ergonomiekonzept regierte. 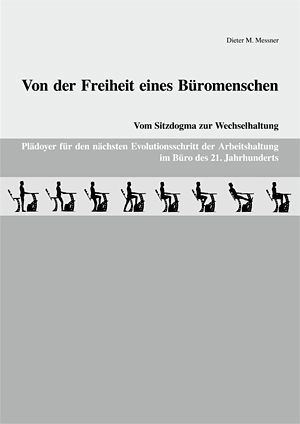 Ein Hochamt der Sitzreligion, Sitzbiedermeier pur, die Branche im trauten ergonomischen Selbstgespräch. Keine Rede davon, dass draußen in der Welt Sitzforschung betrieben wird, die nachhaltige gesundheitliche Schädigungen durch das viele Sitzen beweist. Das war eine kultische Anbetung des Gottes Bürostuhl unter Verschweigung der vielen Menschenopfer, die er fordert. Steifensand: Ist also Sitzen grundsätzlich zu verdammen ? Messner: Im Gegenteil! Sitzen ist super – zur Erholung, zur Abwechslung und für nicht zu lange Zeit. Aber doch nicht ewig! Sitzen und Schlafen dienen der Erholung. Wem fiele es ein, Tag und Nacht im Bett zu bleiben, wenn er gesund ist ? Stehen ist super, stehsitzen ist super! Jede Haltung ist prima, aber eben nur für kurze Zeit, sonst wird sie zur Plage! „Embedded office workers“ sind jedoch zum Dauersitzen gezwungen, das ist der Beginn der Tragödie. Vier Stunden sitzen am Tag müssten für einen Sitzberuf reichen, aber auch diese Sitzzeit sollte möglichst oft unterbrochen werden durch andere Haltungen. Steifensand: Durch welche zum Beispiel ? Messner: Zum Beispiel durch Stehen, Halbsitzen, Stehsitzen, Lümmelstand, Wippstand, Grätschstand, Spagatsitz, durch den Wechsel von Spielbein und Standbein (Ponderation), Gehen auf der Stelle, Erholungssitz, Zehenspitzenstand, Nilotenstand-Varianten auf einem Bein, Startstand und viele andere, die jeder selbst erfinden kann. Dabei muss die Arbeit nie unterbrochen werden, aber es werden jeweils verschiedene Muskelpartien aktiviert. Und jeder Wechsel bringt Bewegung in die Szene. Das ist im Sitzen einfach nicht möglich. Vordere, mittlere und hintere Sitzhaltung sind dagegen armselige Optionen. Von 163 Muskeln werden im Sitzen 100 nicht aktiviert. Steifensand: Wie lang sind denn‚lange’ Sitzzeiten? Messner: Viele Menschen sitzen heute schon zwölf und vierzehn Stunden am Tag am Arbeitsplatz und in der Freizeit. Der Körper beginnt nach vier Stunden Warnsignale zu senden, sagt Dr. Ekblom-Bak. Sie empfiehlt deshalb, im Büro so oft wie möglich aufzustehen und ein paar Schritte zu gehen. Durch die Arbeitsorganisation kann man die Möglichkeit dafür schaffen. Viel sinnvoller jedoch, weil gesünder, ist die Inszenierung des „Auf-Standes“ durch die Einführung der Wechselhaltung. Sie gibt uns die Chance, die Sitzzeit auf das notwendige Maß zu verkürzen. Fortschrittliche Ergonomen empfehlen einen Haltungsmix von 50% Sitzen, 25% Stehen und 25% Bewegen. Sitzen sollte nur eine von vielen Körperhaltungen bei der Arbeit sein. Steifensand: Wie funktioniert die Wechselhaltung ? Messner: Wenn wir die Arbeitsstation mit Stehtisch und Hochsitz auf Stehhöhe bringen, kann abwechselnd im Stehen, im Sitzen, im Stehsitz, im Halbsitz usw. gearbeitet werden. Nur ein Hochsitz ermöglicht diese Freiheit, er ist Angelpunkt-und Drehscheibe für verschiedenste Haltungen. Der niedrige Stuhl hingegen ist eine Bewegungsbremse. Bezüglich der richtigen Arbeitshöhe herrscht in der Branche noch immer Konfusion: Hohe Tische und hohe Stühle bieten viel mehr Bewegungsspielraum bei der Arbeit. Niedrige Tische und Stühle schränken ein, sie sind nur für Erholungs-, Stillhalte- und Rekreationsphasen zu empfehlen. Steifensand: Worin liegt genau genommen der Vorteil der Wechselhaltung ? Messner: In der Integration von viel mehr Bewegung in den alltäglichen Arbeitsprozess. Bewegungsmangel ist schließlich das größte Gesundheitsproblem aller Industrieländer. Wer im Büro mehr Bewegung ermöglicht, die ständige Abknickung von Hüfte und Knie verhindert, die Sitzzeiten reduziert, möglichst viele Muskeln aktiviert, die häufige Bewegung der Gelenke fördert, der tut den Arbeitendes etwas Gutes und stiftet gesundheitlichen Nutzen. Steifensand: Aber es geht doch immer nur um das richtige Sitzen! Messner: No, sorry, es geht um die richtige Arbeitshaltung, und das Sitzen ist nur eine von vielen Haltungen! Steifensand: Welche Arbeitshaltung ist die beste? Messner: Keine! Oder besser gesagt: die nächste, immer die nächste! Das heißt: der Wechsel. Je häufiger ich meine Haltung wechsle, desto gesünder ist das für mich. Bei jedem Wechsel bewege ich mich und Bewegung ist das wichtigste „Vitamin“ für unseren Körper, sein Lebenselixier. Der Mensch ist für Bewegung geschaffen. Deshalb ist es auch eine Ungeheuerlichkeit, schon kleine Kinder mit Hilfe von „Knickmöbeln“ zum stundenlangen Sitzen zu zwingen. Steifensand: Sollten also auch Schüler die Wechselhaltung in Stehhöhe praktizieren? Messner: Ja, unbedingt! Der gegenwärtige Zustand ist eigentlich ein Fall für den Staatsanwalt. Aber dafür gibt es einfach zu viele Tatorte. Steifensand: Wie stellst du dir die Umsetzung deiner Forderung vor ? Für eine derartige Reform fehlt doch das Geld. Messner: Rom ist auch nicht an einem Tag erbaut worden. Wichtig ist ein überzeugendes Produktangebot. Sobald einige Persönlichkeiten und Leitbetriebe mit gutem Beispiel vorangehen, werden sich auch die anderen überzeugen lassen. Besondere Chancen sehe ich zunächst im Homeoffice-Bereich. Daheim kann jeder selbst über die Möblierung entscheiden. Steifensand: Und Frauen sollen bei der Büroarbeit weiterhin sitzen bleiben ? Messner: Die Männer sollten die Pionierarbeit leisten und vorangehen, sie haben es auch nötiger. Das lange Sitzen schadet ihnen vermutlich mehr als den Damen. Es ist wie bei den Radsportlern: Das lange Sitzen im Sattel schadet der Männlichkeit, das ist erwiesen. Daher sollten wir zunächst ein „Man Office“ kreieren. Da aber auch die Frauen nicht für das Dauersitzen geschaffen sind, werden sie uns bald in die Stehhöhe nachfolgen. Steifensand: Wie beurteilst du die Marktchancen der WHS ? Messner: Wenn wir die Botschaft so vermitteln, dass die Menschen verstehen, welchen Risiken sie beim Vielsitzen ausgesetzt sind, eröffnet sich ein riesiger Markt. Wir sind von Millionen reformbedürftigen Arbeitsplätzen umgeben! Das sind Millionen Bürostühle und Arbeitstische!